Smooth moves: MN Dance Theatre's "Orpheus and Euridice"
CRITIC LIGHTSEY DARST TOOK IN MINNESOTA DANCE THEATRE'S NEW BALLET ADAPTATION OF THE CLASSIC MYTH "ORPHEUS AND EURIDICE" AND FOUND THE PRODUCTION TO BE AN ELEGANTLY UNDERSTATED, SMOOTHLY EXECUTED ENSEMBLE PERFORMANCE. Minnesota Dance Theatre and Nautilus Music-Theater’s presentation of composer and librettist Ricky Ian Gordon’s ORPHEUS AND EURIDICE (originally premiered in 2005) is a rare object in the current collaboration-happy performing arts scene: a completely seamless mesh of dance, music, and design in which the styles and egos of all participants bend gracefully to one single vision. The eight dancers maintain a sweet camaraderie; the three musicians (Mindy Eschedor, piano, Pat O’Keefe, clarinet, and Norah Long, vocals) weave one thought together; the flexible vocalist Long even glides along with the dancers, looking like one of them. All concerned move through Tom Mays’s light and set as if it were their native element. The hallmark of this ORPHEUS AND EURIDICE, co-directed by choreographer Cynthia Gutierrez-Garner and Ben Krywosz, is not radical invention, but extraordinary craft that effaces itself in favor of the story. That story is a famous one, and one that seems (unlike the Pyramus and Thisbe legend) inexhaustible. Orpheus’s tragic music seems endlessly interesting to artists of all stripes, while Eurydice’s largely unwritten plight has attracted the attention of female poets from H. D. to Jorie Graham. Orpheus can even be funny, as in Offenbach’s Orpheus in the Underworld (from which we get the well-known can-can). With so many versions out there, it’s hard for any new version to distinguish itself, and Gordon’s Orpheus is merely a simple, at times elegant, slightly modernized retelling, with music from the easier-on-the-ears branch of contemporary classical, Satie-like and vaguely familiar. The libretto’s main innovation is that Orpheus’s music after Euridice’s death is held up as something new in the world—his grief becomes the birth of art, perhaps—but oddly this isn’t supported by either music or choreography, which drive through the narrative here rather than stopping to contemplate. Instead, my attention was caught by a moment in Gutierrez-Garner’s choreography. Euridice’s death begins with the previously lyrical choreography turning convulsive and frenetic—an effective if obvious device. But then, when she dies, Euridice (MDT dancer Melanie Verna) slips from her simple white dress and tiptoes out towards us, away from the grieving Orpheus and their friends. Orpheus is left clutching the white eyelet dress—a strikingly accurate symbol for a dead body. But what’s more striking is Euridice/Verna, standing there in her flesh-tone dancer underwear, as a newly unbodied soul. Unclothed, she’s more present to us than before, more transparently human, and yet there’s an archetypal purity about Verna’s upright form, too. Standing there, she embodies the archaic perfection of a Greek kouros, which renders her entirely unearthly. She stands looking sightlessly ahead, then springs into a moment of wild dance that stops abruptly, and then she walks offstage. This is a surprising vision of the newly dead. In general, as I’ve noted, this is a smooth rather than surprising production. But one element of that smoothness does acquire surprising emotional weight by the show’s end: the economy of design. The set—several white screens hung with fluorescent lights marking off a diagonal, several white benches in the shallow dance space—never changes, but it shifts: benches move, the mellow blue fluorescents give way to harsh pink ones after Euridice’s death, backlight turns the screens into a distorted shadow play for Orpheus’s entrance into Hades. Aside from Euridice’s disrobing, no one changes; after Euridice’s death, happy pink and white costumes poignantly remind viewers of what was. This economy—reflected as well in the spare orchestration and repeated, but slightly altered dance phrases—hints at something deeper. Life and death, love and loss, may seem opposite to us, but they are made from the same materials. Death and loss change us and our world immeasurably, and yet (the worst heartbreak) they don’t change us or our world at all. 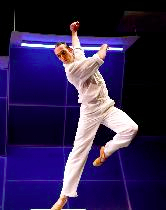 One other element stands out from the slow flow of ORPHEUS AND EURIDICE: Sam Feipel’s dancing in the Orpheus role. For some time Feipel has been a dancer to watch at MDT, not a conservatory ballet boy but a loose and lyrical dancer with a natural appeal. Previously I’d felt it was his own pleasure in dancing that came across so winningly to the audience. As Orpheus, though, he’s more than an easy hero. After Euridice’s death and his failure to win her back, Orpheus plumbs the depth of the well inside him, and he leaves the stage transfigured (dead, really, but in mythology death is not erasure), an artist. So does Feipel. His quiet intensity anchors this earnest performance. Lightsey Darst writes on dance for Mpls/St Paul magazine and is also a poet and editor of mnartists.org’s What Light: This Week’s Poem publication project.